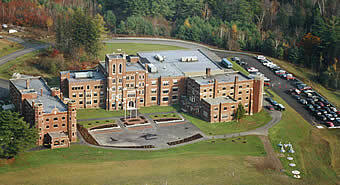 In 1990 the State of Maine purchased the Oak Grove Coburn School complex which is located about 15 minutes north of Augusta on Route 201 in the town of Vassalboro. The site consists of over 105 acres with a main facility complex with renovations suitable for a new training site. In 1998, the Legislature appropriated $11,271,203 to renovate the former Oak-Grove Coburn School and build a specialized training facility. In 2000, the Legislature appropriated an additional $2,000,000 to complete Phase II of the project. Ground breaking for this project was held on September 7, 1999, and Governor King was the keynote speaker. The move from Waterville to Vassalboro occurred on December 22, 2000. Construction was completed in the Spring of 2001.